This blog has a lot of (fascinating) content on writers and education, but I know some people like to cut to the chase, so I will print the summary here. But, you should read the entire blog if you want to gain deeper insight on the subject of popular writers and higher education, and the class issues that lurk just below the surface of the Indie vs Traditional publishing debate. · Nearly 60% had university degrees, with almost as many having graduate degrees as bachelor’s degrees. That’s about double the level in the overall population. · For nearly a quarter of the writers in the Top 100, however, no information was available on educational attainment. Whether that signals a lack of degree or an unwillingness to share the information was unclear. Since the “unknowns” mostly wrote in the Romance genre, it may be accepted wisdom that it is best if writers do not reveal too much on the subject. Both Trad and Indie Romance writers seemed reluctant to disclose. · Female writers tended to be less educated than male writers. That may be related to the age of the most successful writers, which tends to skew to older age ranges, when women were less likely to go to university than men. Given current university enrolment patterns, we would expect women writers to eventually overtake male writers in this regard. · There was some tendency for educational attainment to be higher in older age ranges. Again, this may be an artefact of genre (Romance writers tend to be younger). · There was no strong tendency regarding the relationship between sales rank and educational status. However, the writers in the top decile did tend to be the most educated, and the writers in the bottom decile tended to have the least formal education. · When looking at individual publishers, there was no clear pattern, though it was interesting that Hachette skewed towards fairly highly educated writers. Does this imply that the Hachette/Amazon dispute has overtones of social class antagonism? It seems possible to me. · Overall, Indies had somewhat lower levels of educational attainment than Trads, though the difference was not large. However, if we exclude “unknowns”, Trads were bimodal (many had no degree and many had an advanced degree) compared to Indies (mostly bachelor’s degrees). · More highly educated writers tended to sell at higher prince points than less educated writers. Again, undertones of social class distinctions seem to be present. 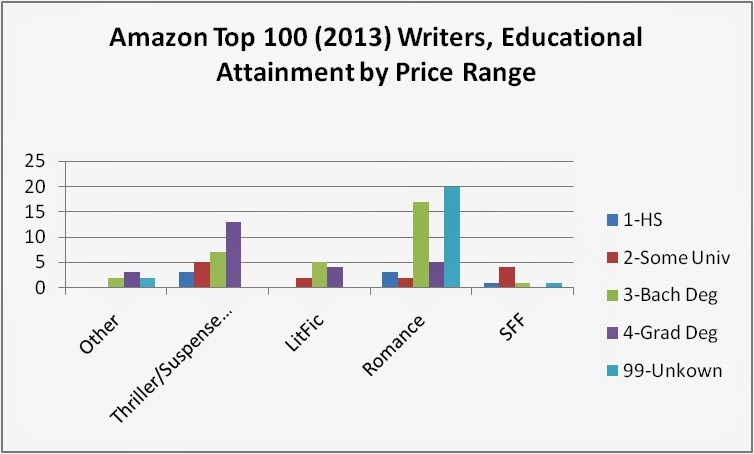 · The “Other” genre had the most educated writers (some non-fiction was in this category). Next was Thriller/Suspense/Crime, which had quite a few writers with advanced degrees, as did Literary Fiction, the next category. Romance followed - most of these writers either had bachelor’s degrees or “unknown” status. Finally, Science Fiction and Fantasy came last, though it was a relatively small category. 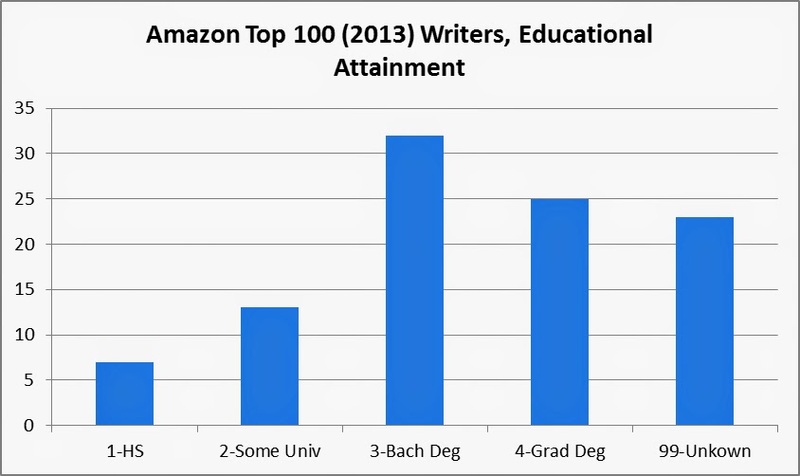 Another item that is likely to be of great interest to writers, publishers and readers is the educational status of writers in the Amazon Top 100. So, we now add data on this background characteristic to the above list. · The innate ability to learn and do complex mental work. Obviously, these are extremely useful attributes for a writer to possess, though the correlation between these abilities and educational status is not complete. Many highly intelligent and creative people don’t have degrees or even high school diplomas; conversely, not all people with advanced credentials are necessarily all that intelligent or creative. · The determination to stick with a difficult task (i.e. a course of higher education) and complete it. As we all know, this is also a very useful attribute for a writer, who has to maintain discipline and focus during a complicated, mentally taxing and time consuming activity. And, like most education, it is not very handsomely remunerated during the doing of the work, though it can ultimately pay off. As noted above, though, the correlation is not exact. Many highly motivated, disciplined people don’t attend or complete university for one reason or another, while some graduates are not particularly diligent or disciplined. Indeed, there is a feeling among some creative people that too much formal training can inhibit creativity, particularly in fiction. · Specific skill sets relevant to a job or profession. In this case, there is probably a reasonable expectation that people with higher levels of education have honed their writing and research skills, both of which are extremely useful for writers. Again, though, the correlation between these factors and educational attainment is inexact. Many graduates are not particularly good at written communication, while many non-graduates are. This is especially true in fiction, where the ability to create story and character is often more highly valued than the ability to construct an elegant sentence. · Social status. People from more advantaged backgrounds are more likely to attain higher levels of education than people from less advantaged backgrounds, for a variety of reasons. These include money, parental “push”, familiarity with the norms of higher education and that whole cluster of things that we think of when we consider the notion of social class. Publishers, and to a more limited extent readers, may have a bias towards writers (or would-be writers) who have more advanced educational credential, based on conscious and unconscious biases. Publishers may simply be more comfortable with people who have degrees, since publishers themselves normally have degrees. At the highest levels, an “old school” mentality may be at work –they may want people who they think “fit in” and are the “right kind of people” to be granted the privilege of publication. Readers in certain genres may share this bias. Conversely, readers in other genres may shy away from people that they consider to be too highly educated, believing that they may be “talked down to” by these writers, who don’t really share their life experiences or world view. First, a quick note on data sources and reliability. 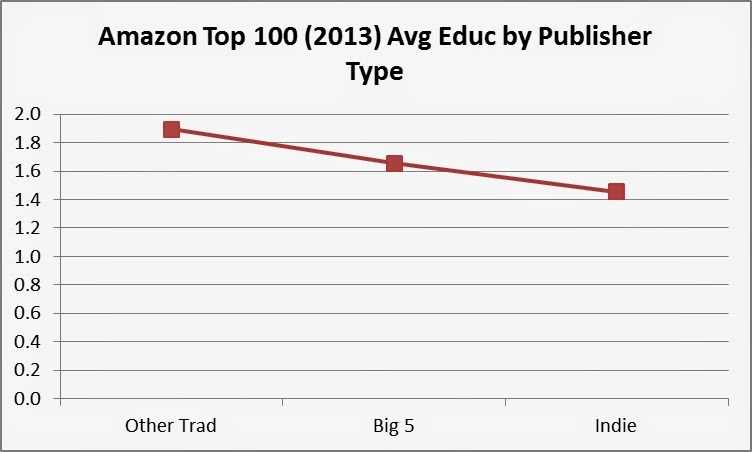 Some 77% of the books in the Amazon Top 100 for 2013 could be linked with the author’s educational status. The data generally came from Wiki, though in some cases the Amazon author page or the Goodreads author page was the source. Occasionally, media articles based on google searches provided some additional insight. Note that the fact that the data was not available didn’t necessarily mean that the writer was or wasn’t a post-secondary graduate. In some cases, there seemed to be a reluctance to share this information, perhaps on the assumption that readers might feel less of a sense of identification with the writer, if they knew the writer’s educational status. For example, in one case the writer did not note her educational background in her bio, but revealed it in a blog entry, where she mentioned “having an accounting degree, of all things”. So, some writers might have simply thought it to be not worth the risk of revealing too much information about this subject or they may have considered irrelevant to their writing life. In the tables that follow, note the last column, headed “Avg Educ”. This is a numeric scale variable, constructed by weighting educational status. As you can see, it is based on recent (2010) U.S. census data, showing relative earnings by educational attainment level for the population as a whole. The idea was to use average earnings as a proxy for the implied value of different educational levels, with more highly remunerated levels receiving higher weightings. These weightings are shown in the index values at the top of the chart. 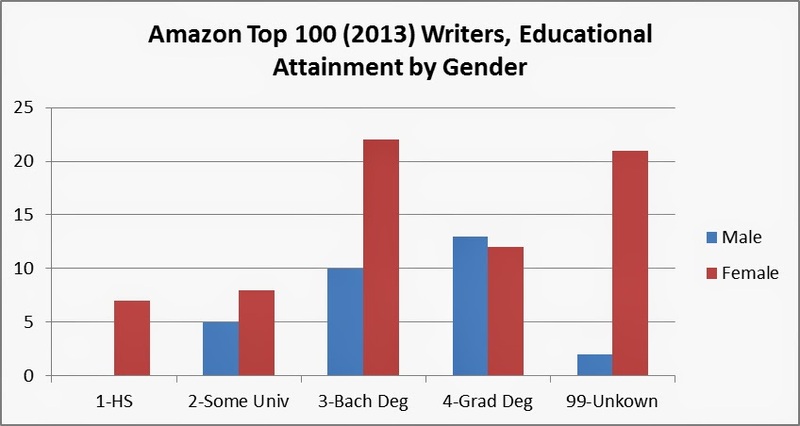 This gives a quick way to quantify educational levels of writers in the Amazon Top 100 in the later breakout tables (for example, by gender). 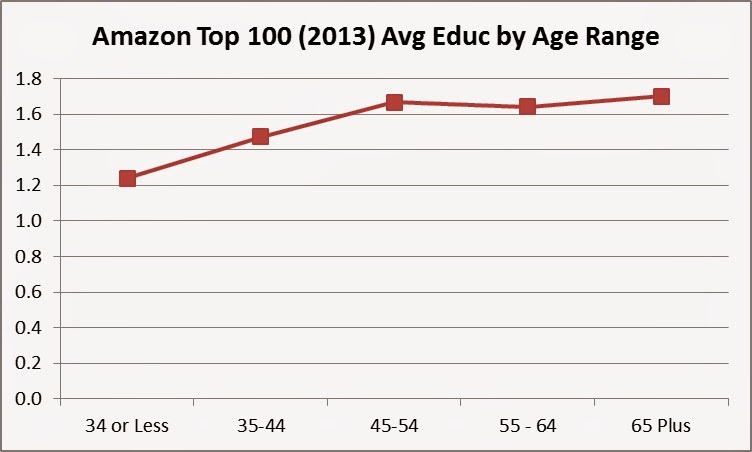 First off, the table and graph below shows the overall educational attainment distribution of writers in the Amazon Top 100 for the year 2013. I should note that if a particular writer had more than one book in the top 100, he or she will be counted more than once in the data below. That seems fair to me, since it effectively gives more successful writers more weight in the data, and it makes the math easy (the counts also happen to be percentages of the total, since there are 100 titles in the dataset). As we can see, the majority of writers had a Bachelor’s Degree, usually a Bachelor of Arts in fact. However a significant number of had a graduate degree (law degrees were fairly prominent). The numeric score of 1.6 indicates that the overall average level of attainment is almost exactly the same as the Bachelor’s degree. Note that for about a quarter of the writers, I could find no reference to their educational attainment . In these cases, I assigned them a numeric weighting mid-way between High School Diploma and Bachelor’s degree. We will see later that there is a definite pattern to the “Unknowns” – they are more likely to be in the Romance genre than others, for example, and more likely to be female than male. As the table below shows, females tended to have attained somewhat lower levels of education than males, in this group. They primarily had Bachelor’s degrees, while males were fairly evenly split between Bachelor and Graduate degrees. This is reinforced by the value of the scale variable for females (1.5, a bit less than the 1.59 value of Bachelor’s degrees) versus 1.9 for males (midway between 1.59 for Bachelors and 2.3 for grad degrees). Female writers were also more likely to have not gone to university or not completed university. When looking at author bios, this seemed to be a legacy of earlier educational attainment differences between the sexes – for example, some older female writers married early in life, straight out of high school and took up writing later. There is also a much greater tendency for female writers in this group to not reveal their educational status. As we will see later, this tended to be the case with Romance writers, who are mostly women. Whether this is a reflection of lower levels of attainment or a reluctance to disclose is unclear. The line graph shows a general tendency for educational status to increase by age range, plateauing at about 1.6 or 1.7 (Bachelor’s level) after age 45. The younger age groups had more of the “unknowns”, but also fewer people with high school or incomplete university studies. The older age groups had more graduate degree holders, but also more people without formal credentials (a bimodal distribution). The middle age group was dominated by Bachelor’s degree holders. As with the gender results, this is partly related to the genre of writers. Romance writers tend to be younger and they are less inclined to share educational background information. Conversely, Thriller writers tend to be in the older age groups, and they often have advanced degrees (especially law degrees). First, a refresher on what these terms mean. A decile is one tenth of the dataset, while a quartile is one quarter of the dataset. 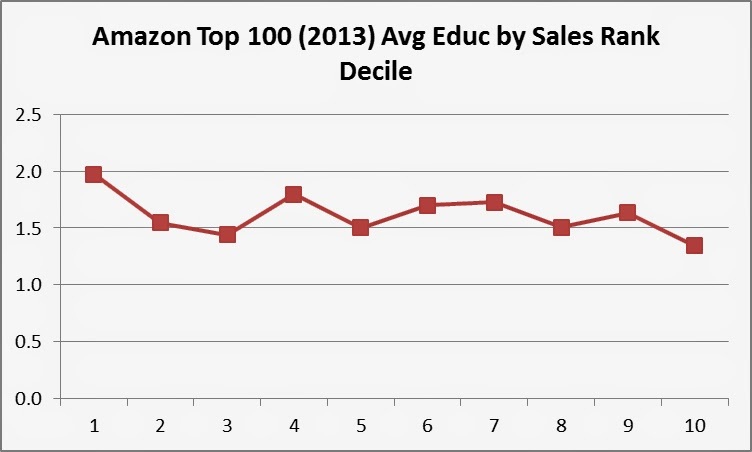 So, Decile 1 is the group whose sales ranked first to tenth, Decile 2 is the group in 11th to 20th, and so on. 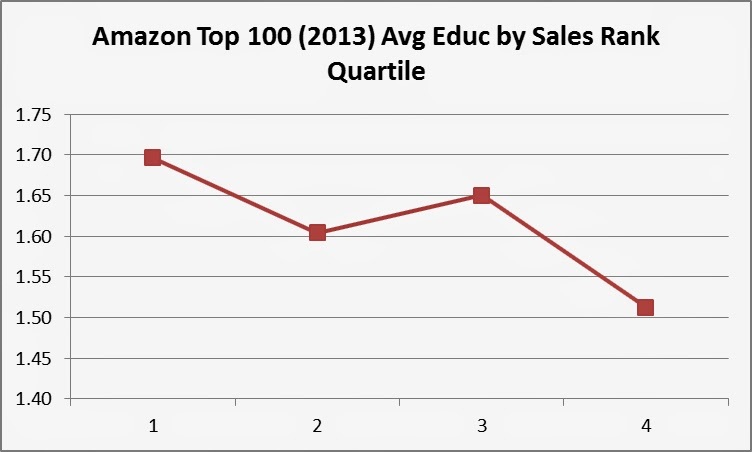 Similarly, Quartile 1 is the group whose sales ranked first to twenty-fifth, and so on. Note that because there are 100 books in the dataset, the math is easy. As the graph below shows, there was a tendency for the educational attainment of writers in the top quartile to be higher than the others (somewhat above Bachelor’s level), and in the top quartile to be lower than the others (somewhat below Bachelor’s). The middle two quartiles came in at about the Bachelor’s degree level (recall that corresponds to a value of 1.59). A similar but weaker trend can be seen in the decile chart (though it is clear that the top decile is higher than the others). 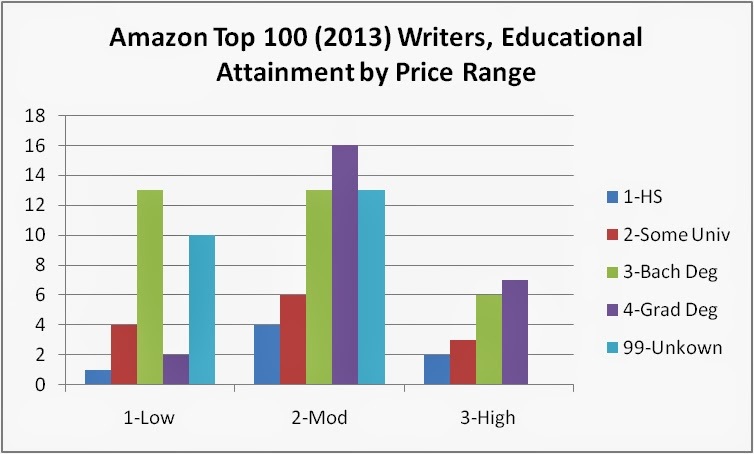 The table below shows the educational attainment of writers, by publisher, sorted by education level. The Big 6 (now Big 5 after the merger of Random House and Penguin) are shown in orange and Indies are shown in yellow. As you can see, there is a substantial spread in the data – some of the “small Trads” and Big 6 head the list, but they also are in the trailing positions. Perhaps the most interesting result is the relatively high placement of Hachette. They are the publisher that is currently in the forefront of the negotiations/dispute with Amazon. The notion that they see themselves as “guardians of literary culture” against Amazon and the Indies may be a reflection of the implied social status differences demonstrated in the table. It is also worth noting that the traditional publishers are hardly monolithic in this regard. In fact, the educational status of Indie writers is the same as Penguin and Simon and Shuster, and higher than Harper Collins. So, the meme that the Big 5 are holding the literary fort against less educated Indie barbarians is an oversimplification. A quick definition is in order. Indie books are those that were self-published or published by very small publishers, while Trad books were published by one of the (usually larger) publishing corporations, such as Penguin or Random House (see above for a list). This comparison is always interesting. As we see in the table below, Indies tend to have somewhat lower levels of educational attainment, though the difference is not very large. Furthermore, it is primarily the greater tendency of Indies to have “unknown” educational status that makes up the difference in status. If we set aside “unknowns”, Trads have a more bimodal distribution - more people are at the extremes (no degree or advanced degree), while Indies tend to be dominated by Bachelor degree holders. Again, a definition is needed to put this data into context. Low priced books are defined as being under $4.00, moderately priced books are between $4.00 and $7.99 and high priced books are $8.00 and up. When we look at the data, we see that there is a clear tendency for educational attainment and the price range of books to be related - lower priced books are more likely to be written by people with Bachelor’s degrees or unknown education, while higher priced books are more likely to be written by people with advanced degrees. So, there appears to be a fairly close correlation between the writer’s social status (as determined by education) and the price that the writer (or the publisher) charges for their books. This is partially mediated by publisher type, as noted above in the Indie vs Trad section. The genre categories are fairly standard breakdowns , as shown in the table below. The “Other” category had the most highly educated writers, though it is a small miscellaneous category. Next was the Thriller/Suspense/Crime category, which had a lot of writers with Law degrees or master’s degrees in Journalism or English. Literary Fiction also had several writers with advanced degrees, as might be expected. After that was Romance - almost all of the “unknown” education writers were in that category. It is not clear whether this is because Romance writing is a niche that is particularly welcoming to people without degrees or whether there is a reluctance to disclose credentials on the part of writers. Reading the bios, I got the sense that “bragging” about educational credentials might be considered bad form in that genre. It is worth noting that both Indies and Trads in that genre had a lot of “unknowns”. Finally, Science Fiction and Fantasy had the lowest average educational attainment, which is a bit of a surprise. However, there weren’t that many SFF books in the Amazon Top 100 in 2003, so this might just be an odd random effect, as can happen when a part of a dataset has small Ns.